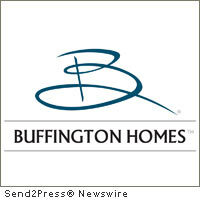 AUSTIN, Texas, June 2, 2011 (SEND2PRESS NEWSWIRE) — Buffington Homes, the leader in Austin, Texas new homes for sale, is pleased to announce the new Capital Series in Shadow Creek. The Capital Series offers exciting new designs from 1,242 to 2,372 square feet, and pricing from $115,900 to $146,990. Every Buffington Home in Shadow Creek is Energy Star Certified, and includes energy efficient features like radiant barrier roof decking, vinyl windows with 336 low E glass, 14.5 SEER air conditioning systems with R-8 insulated ducts, R-13 insulated exterior walls (excluding the garage), R-30 insulation in the attic and R-19 insulation in the sloped ceilings, meaning lower utility bills for our customers. Shadow Creek is a USDA “0” money down designated community. That means a buyer has no down payment and is only responsible for closing costs and prepaid interest. A customer buying a Buffington Home with a sales price of $120,990 and using the USDA “0” down program will have monthly payments under $990 per month. That payment is based on a 4.625% interest rate available as of June 1st, 2011. Interest rates are destined to rise from the current historical lows and customers should take advantage of the low rates and USDA financing in Shadow Creek. Shadow Creek is tucked in-between Buda and Kyle, Texas and is 3 miles east of IH-35. The community features the brand new Ralph Pfluger Elementary which opened the fall semester of 2010. Many homeowners in Shadow Creek enjoy walking their children to school. In addition to the new school, the community features a swimming pool, children’s splash pool, poolside changing and restrooms, sporting courts, playground equipment and a running, walking, biking trail within the neighborhood. Such features and amenities along with quality homes are hard to find in the Austin real estate market apart from Shadow Creek. To visit Shadow Creek, please stop by the Buffington Homes Model Home at 263 Shadow Creek Drive, Buda, TX, 78610. The model home hours are 10 a.m. to 7 p.m. Monday through Thursday and Saturday and 12 p.m. to 7 p.m. Friday and Sunday. The model phone number is 512-523-8672 and the website address is www.mybuffington.com .